This bathroom has been totally remodeled with everything new. The upstairs bath has a handicapped friendly walk-in shower. Roomy upstairs bath has plenty of shelf space for your toiletries. 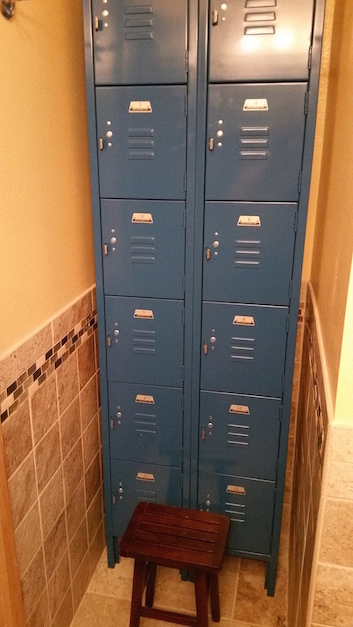 The Locker Room has new fixtures, and has lots of room to change in. No fighting for the mirror. The new large mirror adds to the spacious feel of this bath. The tub shower has modern finishes and adjustable hand wand. The low Tub Shower stall is easy and safe to step in and out of. This bath has 12 lockers for storing everyone's toiletries out of the way. Now you know why we call this the "Locker Room".